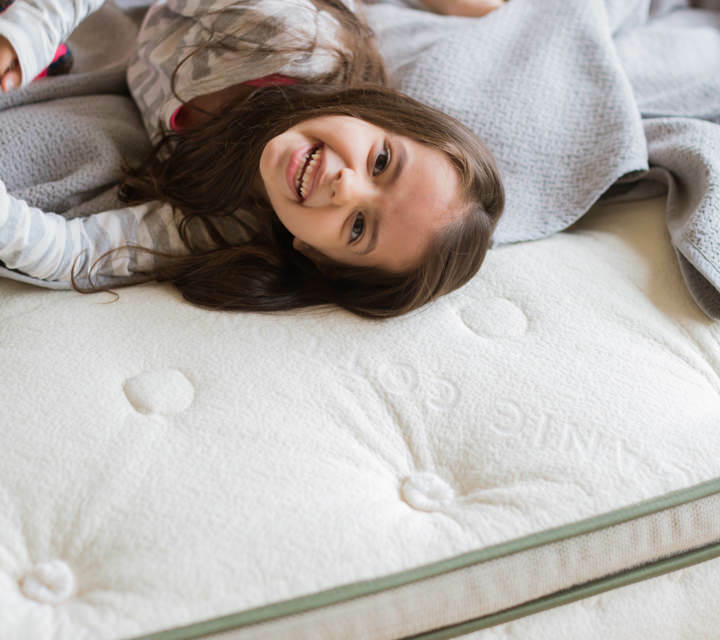 Our natural mattress features 100% GOLS organic certified latex, GOTS organic certified wool, GOTS organic certified cotton and up to 1,414 pocketed support coils. No polyester, polyurethane foams or toxic fire retardants are used. Or explore our Vegan Mattress made without wool. Euro pillow-top with 2 additional inches of plush natural latex for added pressure relief & eco-luxury (permanently attached). 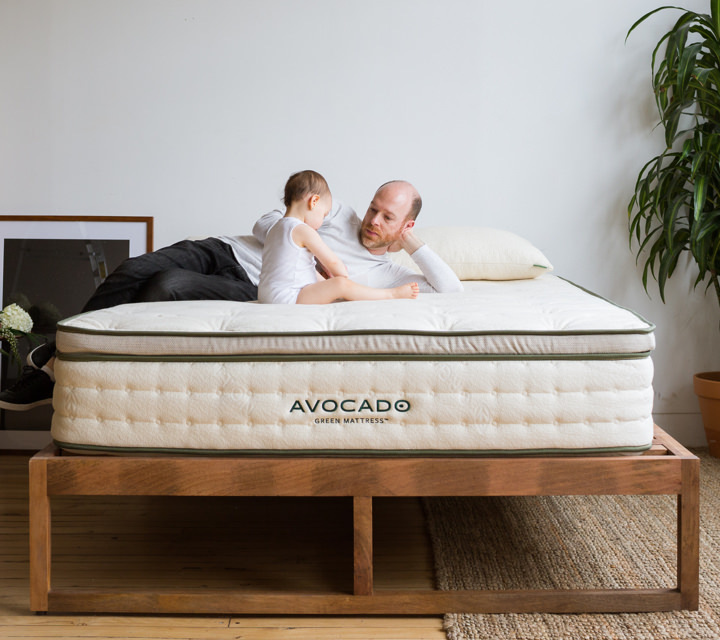 The Avocado Green Mattress is GREENGUARD Gold Certified — and made with natural and organic materials, including 100% GOLS organic certified latex from tree-tapped and sustainable sources; GOTS organic and OEKO-TEX Standard 100 certified wool; and GOTS organic certified cotton. 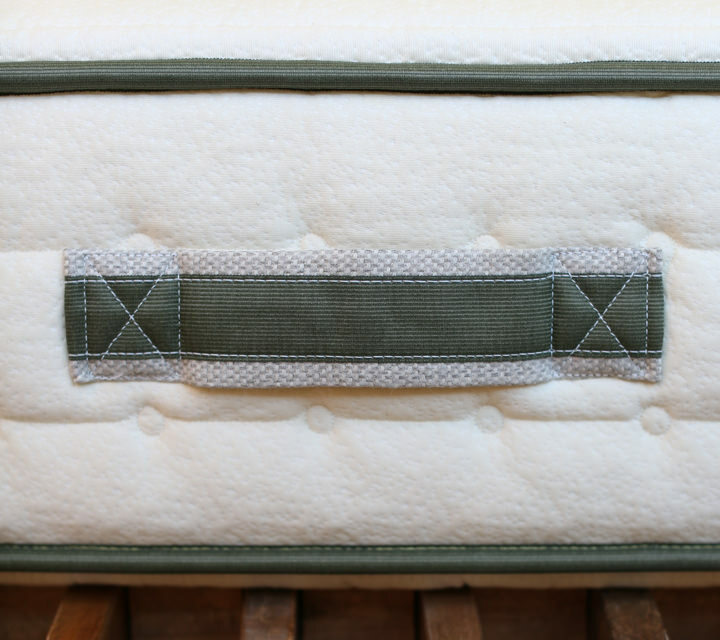 Our non-toxic green bed combines the finest natural cushioning with an internal, zoned, pressure-point support system for proper back support and extended durability. We even make a new Vegan Mattress made without wool. 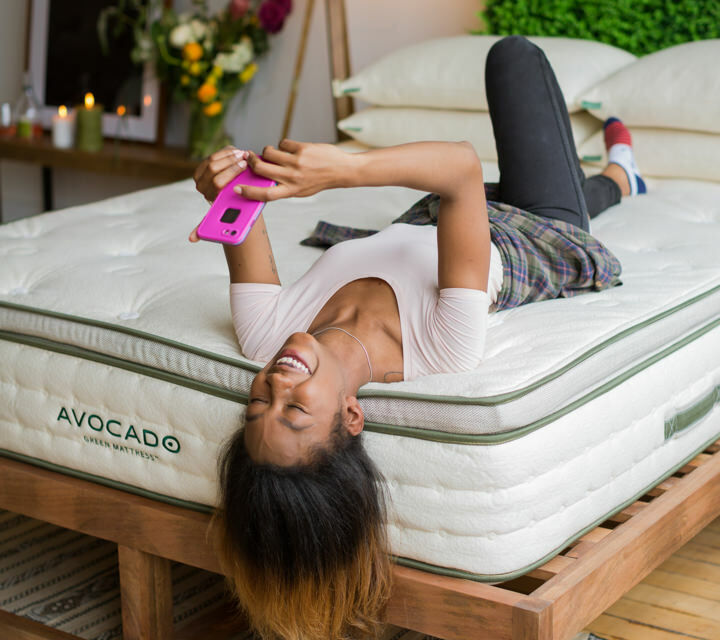 Avocado mattresses feature 100% GOLS organic certified latex rubber foam, made from sustainably harvested sources. It’s an eco-conscious, high-performance material, offering resilience, durability, and temperature control that far exceeds synthetic, blended or petroleum-based polyurethane foams. Our luxurious, button-tufted mattress covers are made with premium, certified organic cotton — one of the softest, most breathable and most comfortable fabrics available. 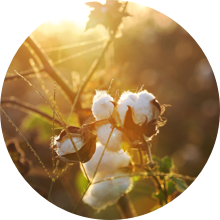 It’s cool, wicks moisture and, better still, boasts the most stringent Global Organic Textile Standard (GOTS) Certification. With a gentle, yet firm feel, our standard Avocado Green Mattress sets the standard for affordable eco-luxury. 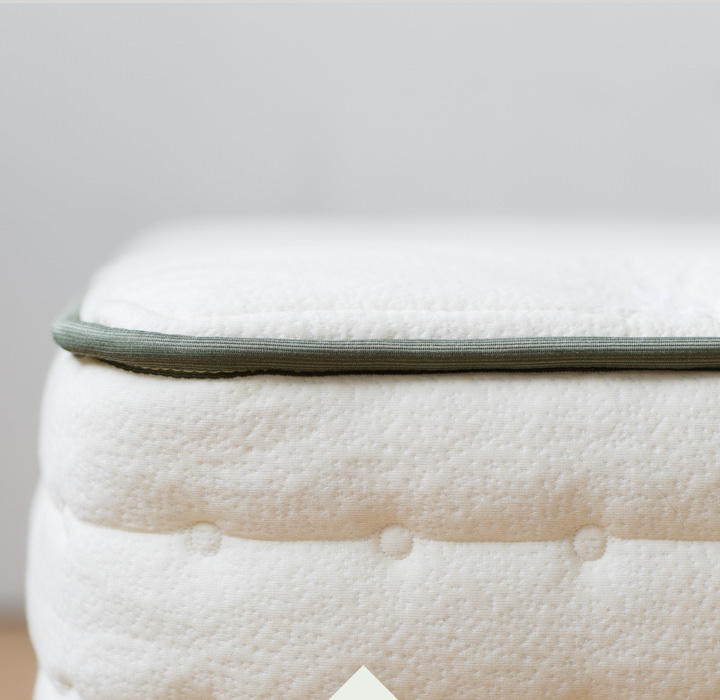 At 11-inches thick, it delivers a balanced level of firmness, comfort and support to create a natural sleeping environment. It is ideal for back and stomach sleepers. Of course, if you ever want to adjust the feel, you can add plush or firm mattress topper at any time. For a luxury-plush feel, you can upgrade your green bed with an attached plush European-styled pillow top, filled with an additional 2-inch layer (for a total of 5 inches) of 100% GOLS organic certified latex rubber foam. At 13-inches thick, it’s ideal for side and back sleepers, athletes, and those in need of pressure relief or a luxurious feel. 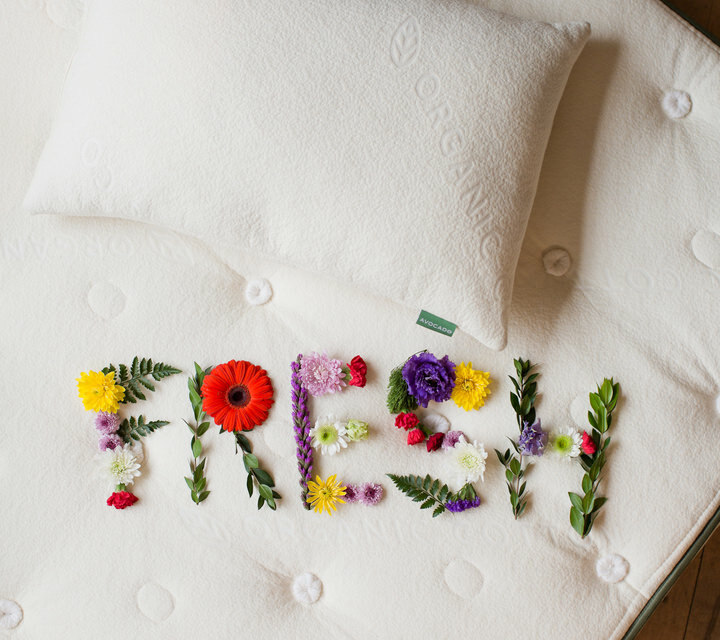 Avocado mattresses feature our distinctive, soft, hand-tufted rosettes made from pure white organic wool. Hand-tufting is a time-honored technique dating back to the 17th century. It’s also highly functional. It prevents trenches and lumps from appearing over time. And button-tufts act as anchors by pulling yarn through each layer of the mattress. This secures them in place without the use of dangerous chemical adhesives. 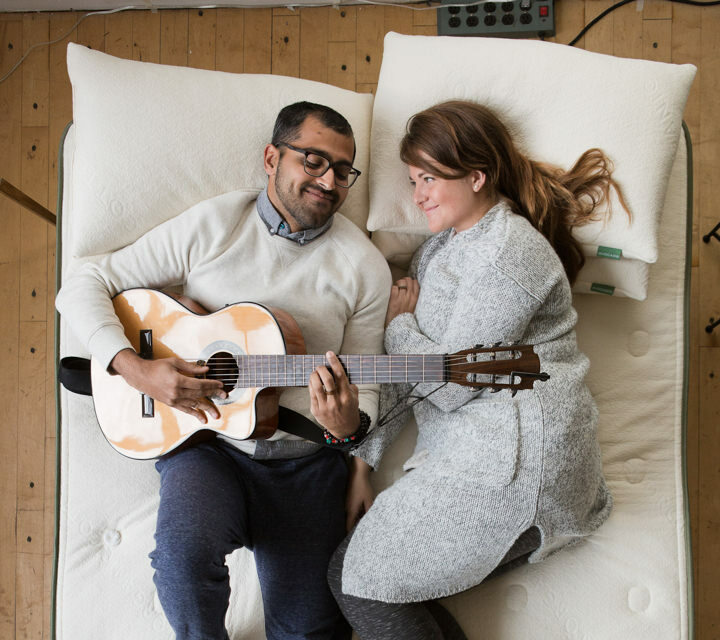 The Avocado Green Mattress features an 8-inch support unit comprised of 756 - 1,414 individually-tuned support coils to ensure proper spinal alignment and balance. These fabric-encased innersprings (made from recycled steel) are arranged in 5 distinct zones with a reinforced perimeter to float independently and reduce motion transfer. This premium, highly durable system allows for optimal and individualized ergonomic and joint support, while at the same time, better contouring to your body shape and evenly distributing weight. Better still, the reinforced perimeter provides critical edge support to eliminate the "roll-off" feeling near the edge. 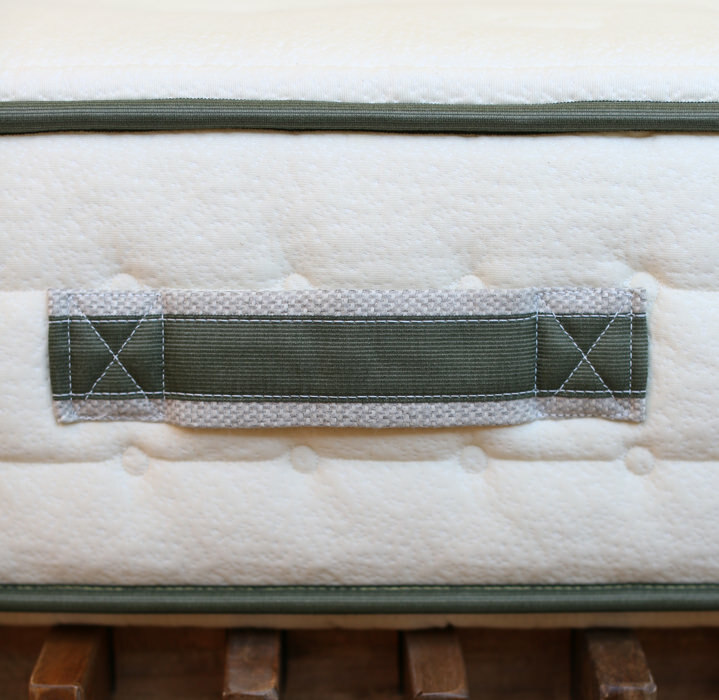 Two upholstered handles adorn both side panels of the mattress, hand-sewn for a tight fit. (Many foam mattresses don’t even have handles.) Our handles won’t bunch out underneath the sheets. Moving or adjusting your green bed is hassle-free. But you never need to flip it! The chemical fire retardants used by most mattress manufacturers are toxic, suspected to cause organ toxicity, hair loss and other neurological damage. That’s why we use a special fire barrier protectant of natural hydrated silica — the same compounds as the gemstone opal — to protect both sides of your mattress. We also use 100% GOTS organic certified wool, which chars but is hard to ignite, as an additional fire barrier. 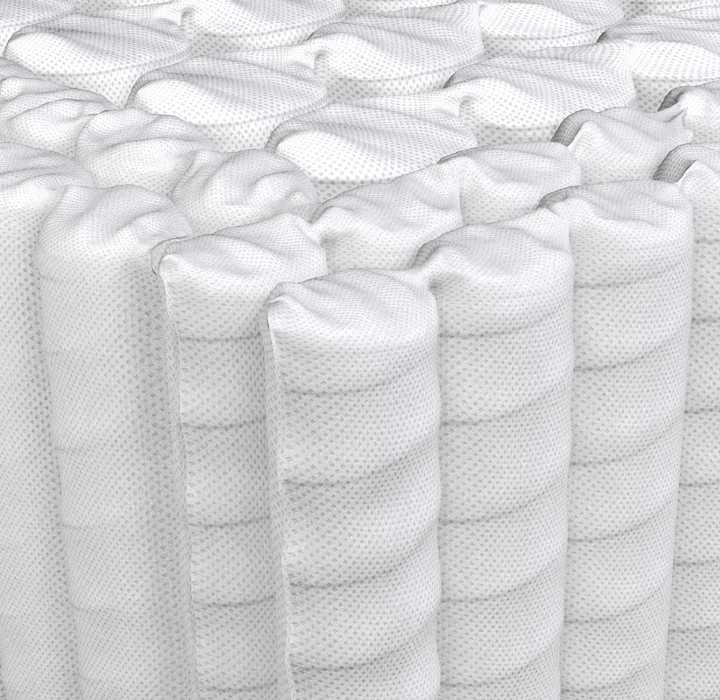 Avocado mattresses exceed all federal flammability and CPSC standards without using chemical flame retardants. Our manufacturer's latex is certified by the eco-INSTITUT in Cologne, Germany, for low emissions and to be safe from volatile organic compounds (VOCs), persistent organic compounds, heavy metals, pesticides, formaldehyde and phthalates. We use 100% GOTS organic certified cotton and wool. No polyester or rayon fibers are used. And there are NO petroleum-based polyurethane foams, NO memory foams, NO chemical adhesives between the comfort layers, NO chemical fire retardants and NO ozone-depleting substances used. 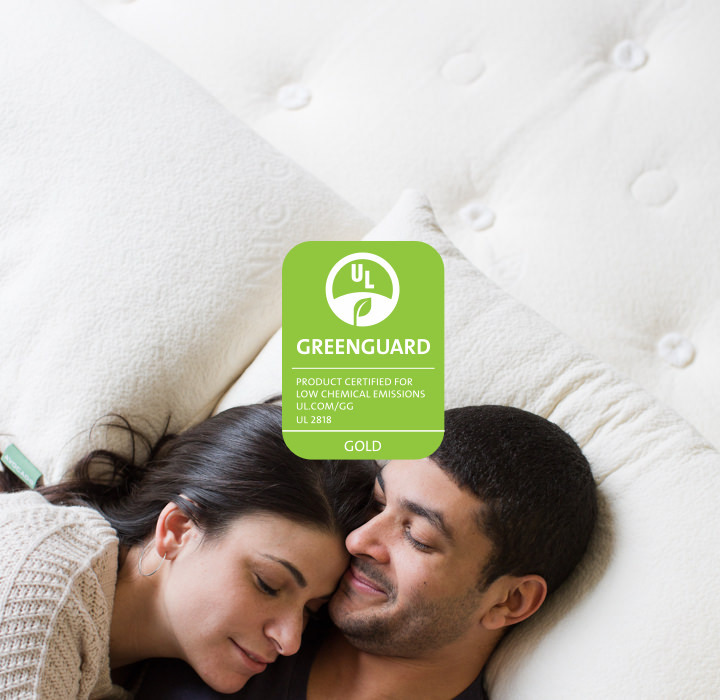 Every finished Avocado mattress is GREENGUARD Gold Certified by UL Environment for low emissions. It means they’re scientifically proven to meet some of the world’s most rigorous, third-party emissions standards for chemical exposure and pollutants, such as volatile organic compounds (VOCs), formaldehyde and phthalates. Few mattresses and pillows qualify for this gold standard. For a deeper dive into indoor air quality, pollutants and your health, visit our Greenguard Gold Certification page. For specific dimensions and weights, visit our Help Center. GREENGUARD Gold Certified by UL Environment for low emissions. GOTS Organic Certification from Control Union. 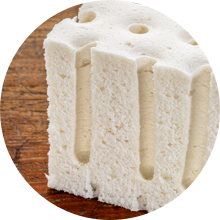 We use Dunlop latex in our mattresses because it is more eco-conscious than Talalay latex, which requires more processing. Our 100% GOLS organic certified latex is sourced from tree-tapped and sustainable sources in Asia and is eco-INSTITUT® certified (tested for hazardous materials and substances) by our latex manufacturer. Dunlop latex is naturally antimicrobial, cooler than memory foam, and also more durable than Talalay latex. 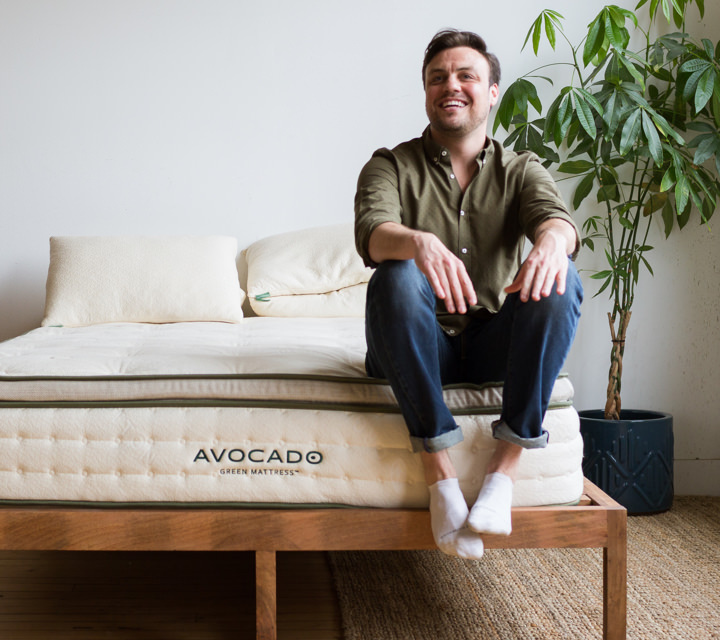 On our standard Avocado mattress, we use two seamless layers of organic latex — 2 inches in the comfort layer (D65 / 14-19 ILD, soft) and a 1-inch layer (D65) as a core base component. 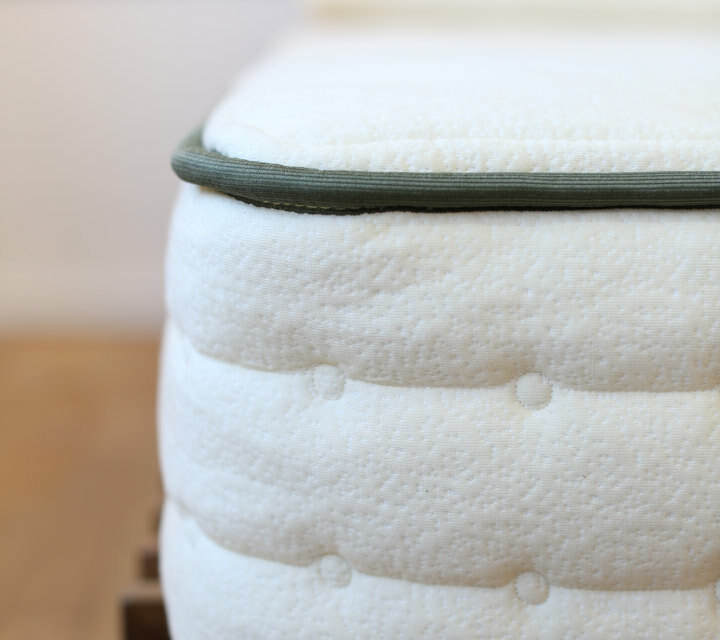 On the Avocado Mattress with the optional, attached Pillow-Top, we use three seamless layers of organic latex — 2 inches in the Euro-top layer (D65), 2 more inches in the comfort layer (D65), and another 1-inch layer (D65) as a core base component. No blended or synthetic latex is used, there are no seams to break down over time, and no chemical adhesives are used between the comfort layers. 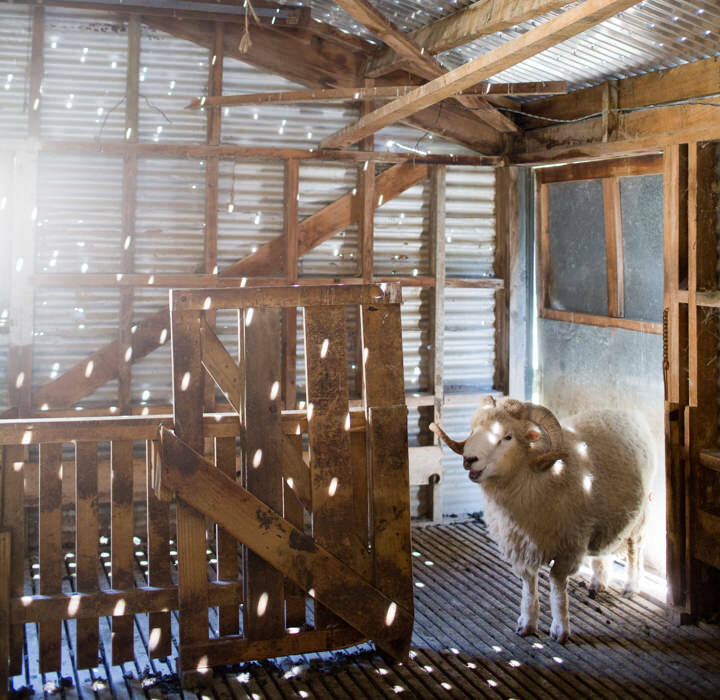 The benefits of wool’s complex and natural physio-chemical structure are endless: it wicks away moisture, keeps your mattress smelling fresh, and acts as yet another all-natural fire barrier. It’s breathable — both warm and cool when you need it. Its natural crimp gives it bounce, body and soft support characteristics. And it’s also non-allergenic (ideal for those who suffer allergies to feather and down or synthetic bedding products) and a renewable resource. 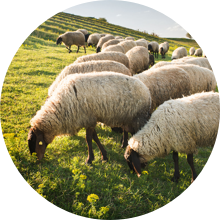 No additives or synthetics are added to the wool. 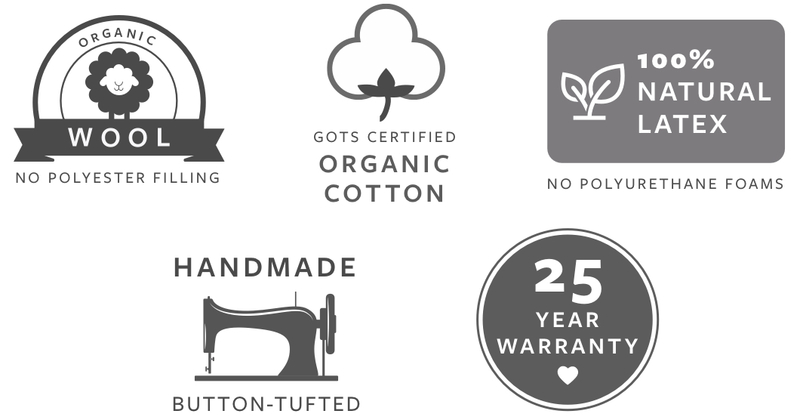 At Avocado, we add a layer of pure, naturally crimped 100% GOTS organic certified wool (1 ounce per square foot) under the 100% organic certified cotton ticking in every mattress. We do not blend any rayon, polyester or flame retarding chemicals with our wool. Our organic wool is STANDARD 100 by OEKO-TEX® certified — a globally uniform testing and certification system for all stages of textile production, ensuring that it is free from harmful substances. Vegan? 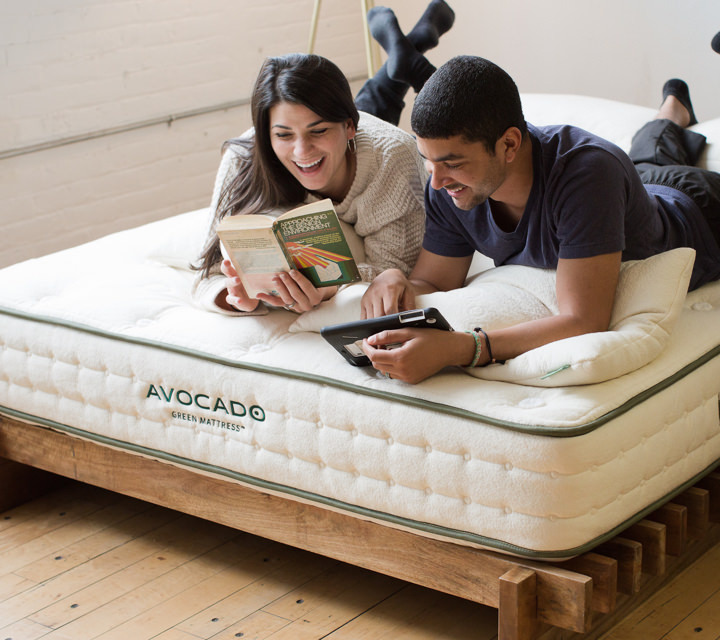 Explore our Avocado Vegan Mattress. For a luxurious and premium finish, we use 100% GOTS organic certified cotton in a soft, natural color. No non-woven or polyester fiber is used. Responsibly and ethically sourced from India, this durable textile is button-tufted by hand with cotton yarn rosettes, which secure the cotton ticking and internal mattress layers firmly in place without the use of chemical and/or water-based chemical adhesives. Even the green sewing thread used in the stitching and embroidery is STANDARD 100 by OEKO-TEX® certified for environmental compliance in production. Hand-stitched tape edges (double stitched) and four heavy-duty upholstered handles complete the package. 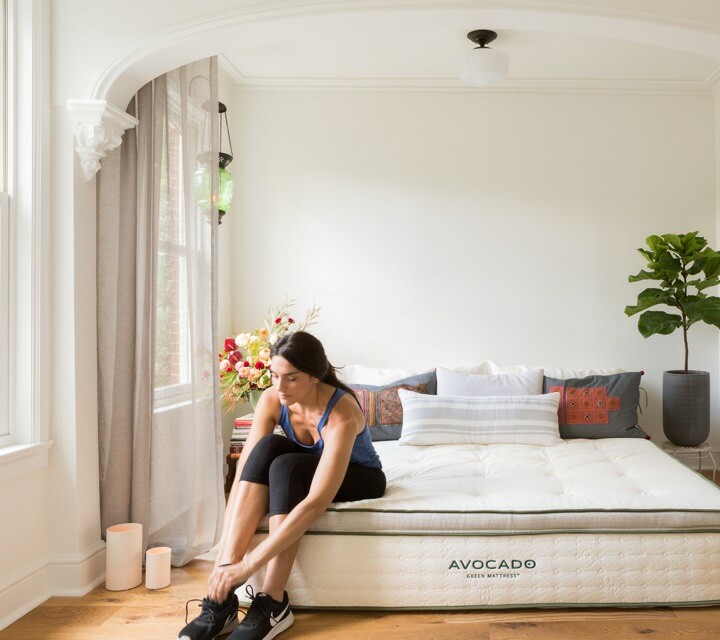 The Avocado Green Mattress features one of the most advanced, internal, pressure-point support units available made by Leggett & Platt — a Quantum Edge® Elite Combi-Zone®. There are between 756 (Twin) to 1,414 (King) individually wrapped innersprings — arranged in five strategic zones, to support hips, back, and shoulders, plus a reinforced steel perimeter giving the bed a consistent level of support all the way to the edge. Encased in a food-grade polypropylene fabric (non-woven and non-toxic), these premium springs float independently to further improve airflow, support and spinal alignment. There are 3 wire gauges used: 16 gauge (narrow diameter) perimeter coils in two zones; 17 gauge (a slightly more narrow diameter) coils through the center one-third section; and 14 gauge (larger diameter) coils on both sides of the center section (the same in the shoulder and hip areas, since our mattress is designed to be rotated regularly). Made from heat-treated and stress-relieved wire, these upcycled steel coils enable our mattress to deliver firm edge support for the life of the mattress and benefit those in critical need of back pain and pressure-point relief. Hydrated silica has a long history of safe use, even as an ingredient in food products. It’s listed by the US Food & Drug Administration to be Generally Recognized As Safe (GRAS) and has no known toxicity or carcinogenicity. (Tom’s of Maine® even uses it in their toothpaste.) Hydrated Silica acts as an effective and natural fire barrier on both sides of our mattresses that complements the flame retardancy of our wool. On a scale of 1 - 10 (with 10 being the firmest) our standard Avocado Green Mattress rates as a 7, which is gentle, yet firm. 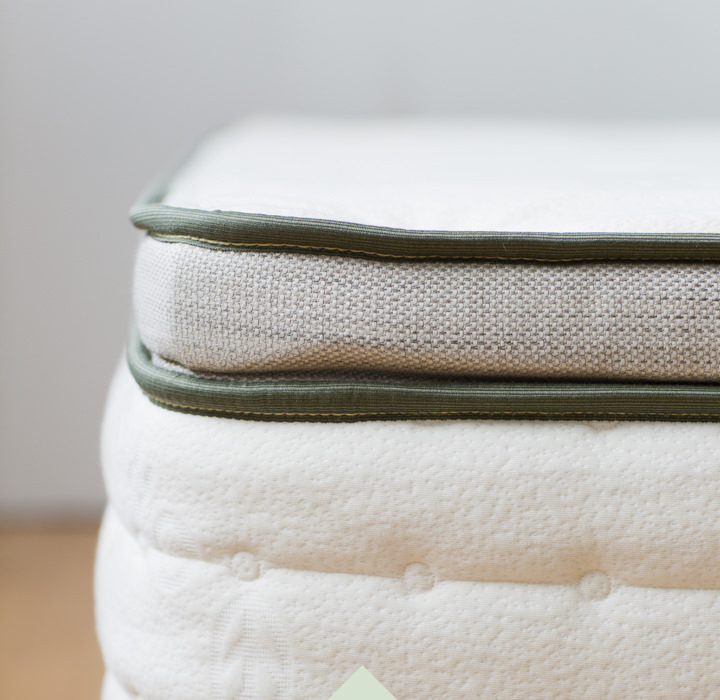 It's ideally suited for back and stomach sleepers, as well as lighter individuals and growing children — anyone in need of natural cushioning and medium-firm support. 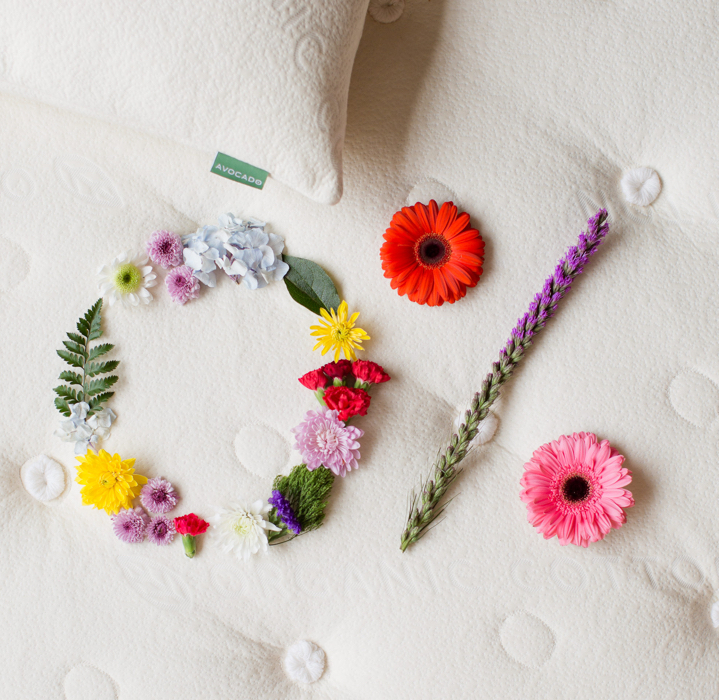 With the pillow-top option, our mattress rates as a 6. (It is not overly soft, "plushy" or "sinkable." A mattress that is too soft can actually cause back pain and restless sleep). Instead, our pillow-top model offers just the right amount of added luxury and buoyant cushioning, all of which is buttressed by strategically zoned back support. Our pillow-top model more easily adapts to your body's natural curves, and as a result, is ideally suited for side sleepers, all-around sleepers, heavier individuals, athletes and those in search of pain relief, pressure-point relief and critical back support. Read What They Have to Say About Avocado. We voluntarily offset our emissions associated with 100% of our product shipping — as well as 100% of our factory in Los Angeles — by proudly supporting carbon offset reforestation projects globally via Carbonfund.org on an annual basis. 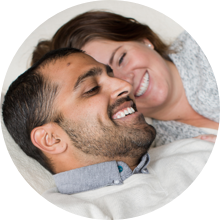 Your 100 night risk-free mattress trial begins after you receive your mattress. Our "Success Tips" Help Center article provides valuable insight to help ensure your Avocado experience meets and exceeds expectations. A law label is a legally required tag or label on new mattresses that describes the interior filling materials. Few companies will share this information prior to your purchase because it separates fact from marketing hype. We believe differently. 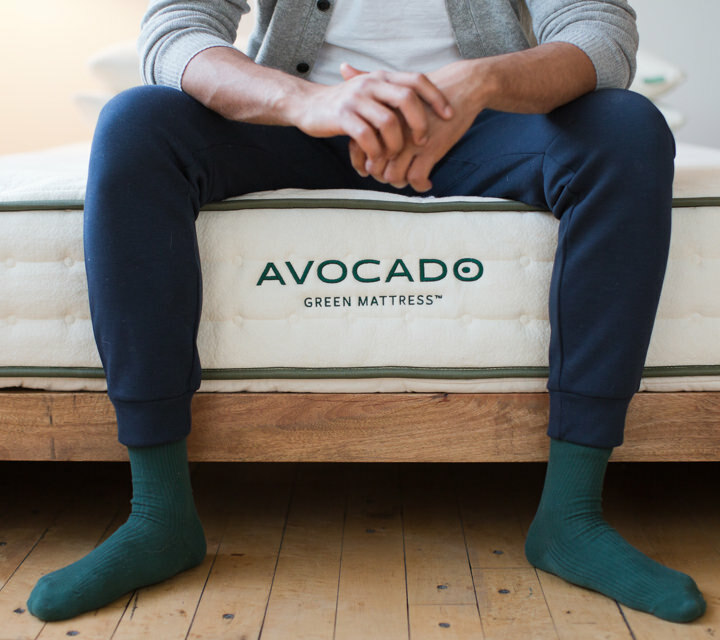 Here's what the legal tag on the standard Avocado Green Mattress actually says: Made in California with internal materials (based on weight) consisting of Natural Latex (73%), Natural Wool Fiber (21%), and Certified Organic Cotton (6%). 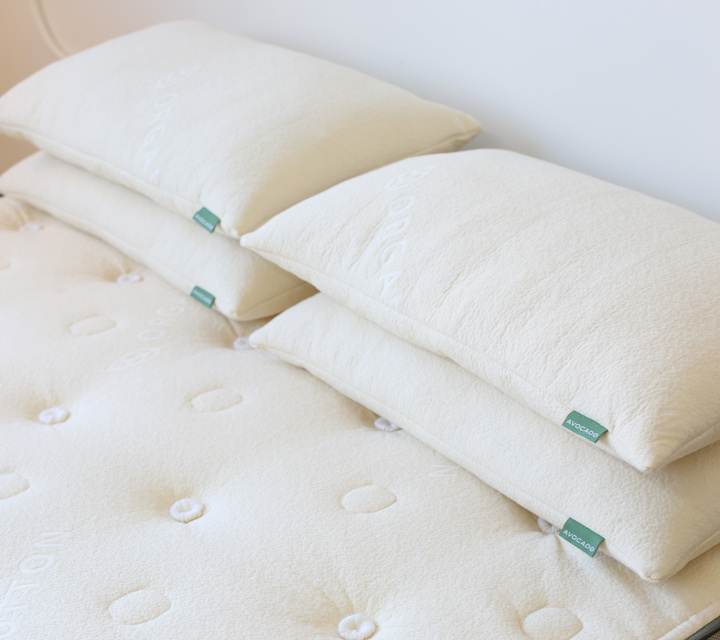 On our pillow-top mattress, it consists of Natural Latex (87%), Natural Wool Fiber (7%), and Certified Organic Cotton (6%). Note: NO polyurethane foams, NO memory foams, NO synthetic foams, NO latex blends, NO chemical adhesives between the comfort layers, and NO chemical flame retardants are used! Or if you prefer, we’ll deliver and unbox it in the room of your choice for just $199, and even take away your old mattress set. Sleep on it for up to 100 nights. If it's not right for you, we'll arrange to pick it up and give you a full refund. There are no restocking fees. Your purchase is risk-free! 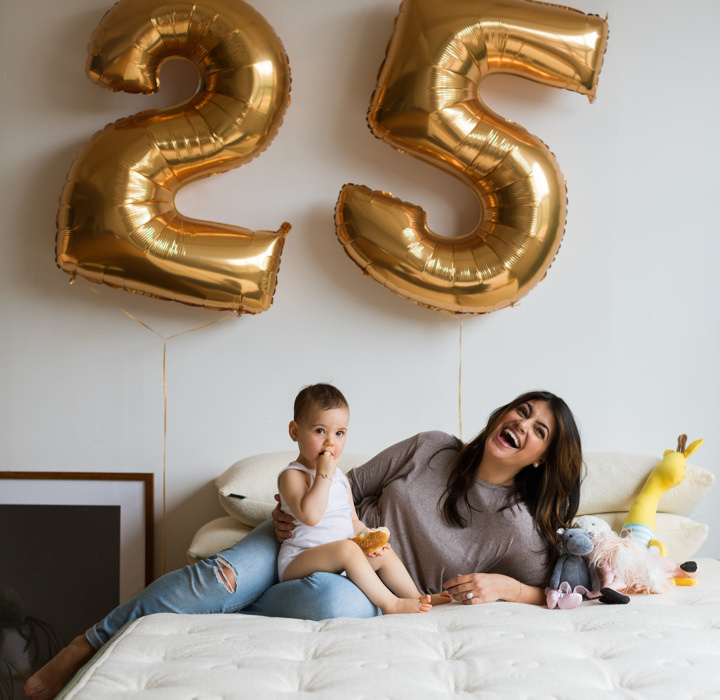 Avocado Green Mattresses are backed by one of the industry's best warranties — 25 years! 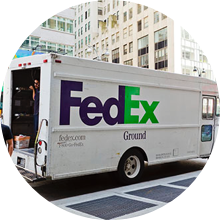 The first 10 years offer non-prorated protection (full replacement value and shipping costs), while years 11-25 continue with prorated protection. Friends of Trees is inspired by the people of Oregon and Washington. They have one thing in mind: "planting trees and growing healthy communities together." 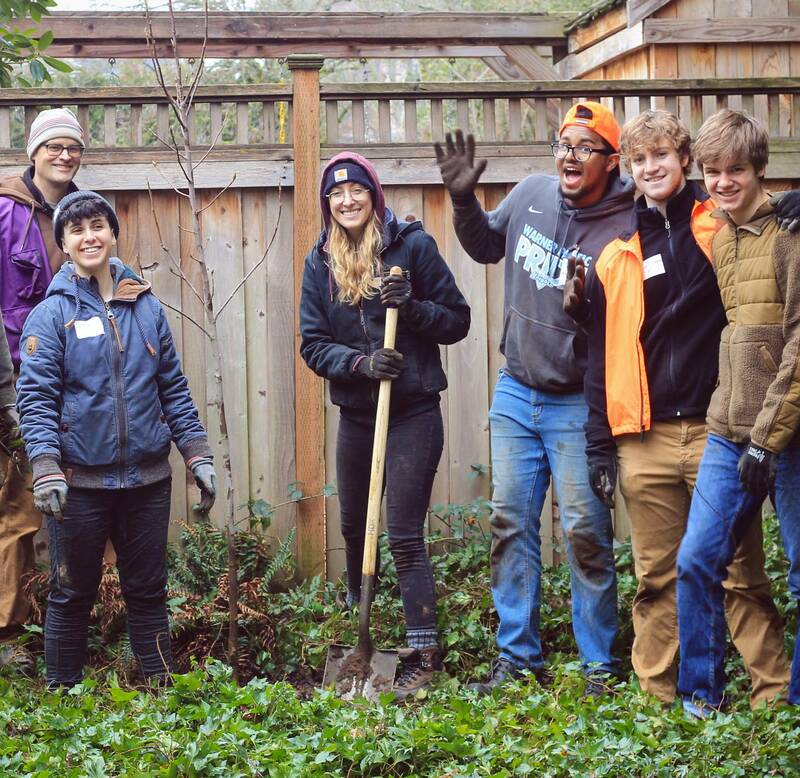 Founded in 1989 by a resident of Portland who loves trees, they have now grown into a regionally recognized leader who is improving the urban tree canopy while restoring sensitive natural areas. If you're in the area and want to get to know the people of the neighborhood, you can learn more about their volunteering options. We're happy to share that they are now part of our giving initiative and a percentage of each sale from this month will go to support their mission. Together, we're excited to inspire change and grow like-minded communities!